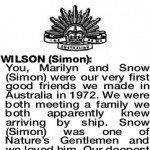 1941 - 2019 Loved husband, best friend and soul mate of Marilyn, dearest dad to Robyn, Andrew, Michael and David. 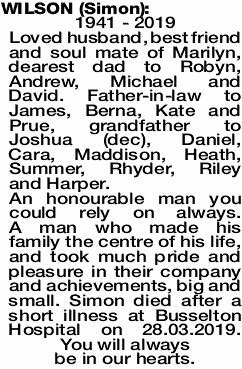 Father-in-law to James, Berna, Kate and Prue, grandfather to Joshua (dec), Daniel, Cara, Maddison, Heath, Summer, Rhyder, Riley and Harper. An honourable man you could rely on always. A man who made his family the centre of his life, and took much pride and pleasure in their company and achievements, big and small. 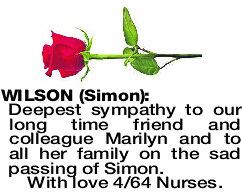 Simon died after a short illness at Busselton Hospital on 28.03.2019. You will always be in our hearts. 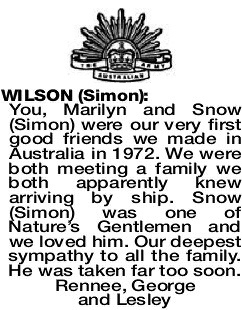 Family and friends of the late Simon Wilson of Busselton are invited to attend his Funeral Service to be held in the Bantry Chapel, Busselton Funeral Centre, 105 Bussell H'way, Busselton at 11.00am TUESDAY (2.4.2019). 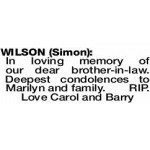 In loving memory of our dear brother-in-law. Deepest condolences to Marilyn and family. RIP. 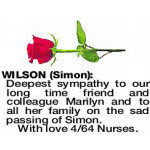 Deepest sympathy to our long time friend and colleague Marilyn and to all her family on the sad passing of Simon.